GRAVENHURST — Given the state of Sino-Canadian relations, some may say it’s foolhardy for the Town of Gravenhurst to continue advocating for private Chinese high school at the old Muskoka Centre this week. MPP Norm Miller, left, arranged provincial ministry meetings for district councillor John Gordon and Mayor Paul Kelly this week, including Minister of Municipal Affairs and Housing Steve Clark. But with the stakes high as they are, you could give them credit for at least trying — without looking desperate. After facetime with some provincial ministers before Christmas, thanks to MPP Norm Miller, they were both at it again this week talking up the former mental health facility. And with the province providing more money for mental health, it may not be such bad timing. 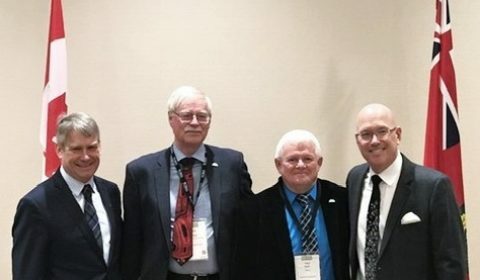 The town says in a release this week that it was “well represented” at the Rural Ontario Municipal Association (ROMA) Annual Conference in Toronto, Jan. 27-29. A delegation consisting of Mayor Paul Kelly, district councillor John Gordon and Scott Lucas, director of development services on hand, they got another chance to plead their case for the province to divest itself of the 70-acre property for the good of the community and province. Town officials called it yet another “excellent opportunity” to continue to engage with provincial ministries in regards to the “Muskoka Regional Centre Redevelopment” project, as they are now describing it. “We are proud to represent Gravenhurst’s best interests amongst the premier of Ontario, the various provincial ministries and over 1,200 municipal delegates in attendance,” said Kelly at the annual gathering where communities outside the GTA get to hob-nob with the Queen’s Park power’s that be. “This gathering proved to be an important opportunity for the town to continue to engage with our provincial counterparts in regards to the Muskoka Regional Centre (Ed. note: Wrong name, but that’s a story for another day) development. “We were able to have frank conversations with the Honourable Bill Walker, Minister of Government and Consumer Services, Honourable Steve Clark, Minister of Municipal Affairs and Housing, Stephen Lecce, Parliamentary Assistant to Monte McNaughton, Minister of Infrastructure and MPP Robert Bailey, Parliamentary Assistant to the Minister of Government and Consumer Services to ensure our mandate is brought to fruition. “I also want to sincerely thank Norm Miller, Parry Sound-Muskoka MPP, for joining us in Toronto and helping us bring our concerns to the forefront,” added Kelly. “At ROMA, we continued to build on a positive conversation that we started last November with the province, in which we shared the project’s history to date, the town’s economic goals and some of our ongoing challenges. Our personal conversations with these ministry’s gave us the opportunity to reiterate council’s position of making the Muskoka Regional Centre property, one that would bring substantial full-time, year round employment to Gravenhurst and the Muskoka region, not to mention a substantial list of advantages for the province,” said Lucas. “We have left this conference feeling very confident that the province wants to make the town an inclusive stakeholder in this process and has every intention of reaching out to a potential property investor to work with the town to ensure our goals are met,” added Kelly. at muskokatoday.com ~ just $25 per year online.